Neurontin takes days to work on peripheral neuropathy, but only hours for seizures. I felt so well and so energized last night that I didn’t want to sleep. I was scared to take this med. I expected it to go more of the way of a drooling idiot rather than smarter! 🙂 This is FANTASTIC!!!! I baked cinnamon rolls last night and got up this morning to cut and wrap them. I had energy and I had hardly slept! This feels a lot like taking high doses of prednisone. I just can’t believe how much better I feel!!!!!! 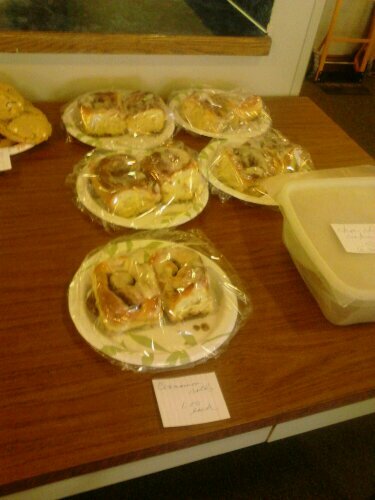 Since I have been sitting here, LOTS more baked goods have walked in! Wow, quite a bake sale. It’s to earn money for summer picnics here at the apartment building.